This release contains the complete recorded work of Philadelphia born pianist Harold Corbin who died of a narcotic overdose just a few short months after completing the Roulette album “Soul Brother” at the tender age of 28. The two bonus tracks are taken from a singles release on the 20th Century label which became something of hit in the Philadelphia area after which he was offered a contract with the Roulette label. 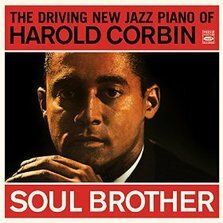 Harold Corbin is a percussive pianist with a number of influences not least Errol Garner but he had talent and would probably have developed his own style if he had an early demise. Seven of the compositions on the album are originals by Harold Corbin and he also shows some promise in this area. “Rene” is a particularly nice tune and his debt to Errol Garner is apparent in both his playing and his writing. Another track which is very similar in style and composition is “The Girl in the Window”. The title track “Soul Sister” and it’s companion piece “Soul Brother” are very much compositions of the Sixties with that down home funky feel but were very popular during this period. If you are a lover of this type of piano playing give this release a try you won’t be disappointed as it has enough variety on it you interested.